Hello! It’s Tuesday and you know what time it is…Top Ten. Top Ten Tuesday is a weekly feature hosted by The Artsy Reader Girl, Jana every week, she posts a new topic/top ten list and invites everyone to share their picks. I looked at this week’s challenge and it sounded like a fun one. It’s all up to the interpretation of course. I think for me a cozy winter read is a book that can do one of many things: One might be a cozy mystery where I can plop down into a little town, get to know the people and solve a mystery without any gore. Another might be a science fiction or fantasy that allows me to escape to another world with magic and/or cool science. Another might be one that wraps me up in a light family drama. And finally one could transport me to another country where I can learn about another culture without leaving my cozy reading nook! I have a thing about buying used cozy mysteries at independent stores. I love cozy mysteries for many reasons but I really like the fact that they are typically series and you can stay with the characters for a while. They also always have cute covers and are small enough to go in my beach bag in the summer. I also like reading them between my heavy non-fiction books. 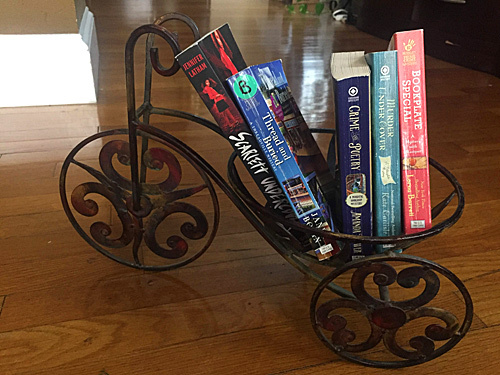 I selected four different cozy mysteries from my collection. Thread and Buried, A Threadville Mystery by Jane Bolin – I love that cozy books are based around bookstores or crafts. Crime and Poetry, A Magical Bookshop Mystery by Amanda Flower – Oops, I lied, I did read this one. It was really cute. I love the cat, whose name is Emerson in this book. Read it and you will see why. Murder Under Cover, A Bibliophile Mystery by Kate Carlisle – I am waiting to dive into this one. It will be my first from this author. Bookplate Special, A Booktown Mystery by Lorna Barrett – Another oops. I read this one too. I read the first in the series and then this one. It has a really cute cast of characters and light romance. Scarlett Undercover by Jennifer Latham – This one isn’t a cozy mystery. I have been wanting to read this since it came out in 2016. I love the diversity in the characters. The main heroine is a black Muslim. Akata Witch by Nnedi Okorafor – For the obvious reasons I have been meaning to read something by Nnedi Okorafor. I own 3 books by this fantasy author and yet have not cracked one up. Burial Rites by Hannah Kent – Have had this book for ages and looking forward to it transporting me back in time to Iceland to discover what really happened in this murder trial. A Man Called Ove by Frederik Backman – I am probably the last to read this. I won’t even watch the movie adaptation until I read the book. Because we all know the books are always better. My Grandmother Asked Me to Tell You She is Sorry by Frederik Backman – I saw this in the thrift shop for $1.59 and thought, if everyone liked the first book this might be good too so I picked it up. What the Fly Saw by Frankie Y. Bailey – Last year, I tried collecting mysteries written by Black females and this was one of the many I picked up. I can’t wait to read this one. So there are 10 of my cozy picks. Can’t wait to see what your list!